Joy for local Euro Millions winners	The search for a Dreamland operator begins! On Friday 11th July, the new £1.5 million Maidstone Exhibition Hall was graced by the presence of Prince Edward, the Duke of Kent, who granted the Hall his royal seal of approval. 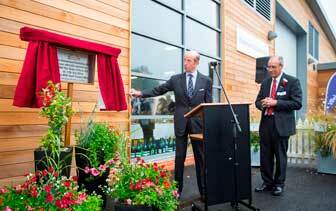 The Duke of Kent was invited to open the Exhibition Hall as an esteemed guest of the Kent County Agricultural Society, and subsequently opened the Hall officially during the 2014 Kent County Show. The Exhibition Hall, which is based in Maidstone, is intended to consolidate the Kent Event Centre’s credible position as one of the largest and most flexible venues in the South East. The single span building is 44 metres wide, 72 metres long and can seat up to 4,000 people in a theatre style layout. Officials at the Kent Event Centre are extremely optimistic at the various prospects which this new Exhibition Hall will offer them. Given the notable success of the annual Kent County Show, many Kent Event Centre officials are hopeful that the new Exhibition Hall will attract similar custom and praise. For instance, over the course of 3 days, the 2014 Kent County Show attracted over 75,000 visitors who were able to enjoy the county’s prestigious farming, countryside and rural life demonstrations. With over 400 exhibitors and trade stands, as well as over 300 competitions, activities and displays, the Kent County Show is a veritable showcase of all the ‘Garden of England’ has to offer. Fortunately, the Exhibition Hall is already expanding in its popularity and public awareness. Even before its completion and official opening, the Hall has already begun to attract bookings from a variety of reputable clients. For instance, whilst the Hall was still undergoing completion, it was reserved by the Kent Invicta Chamber of Commerce. Having heard about the Kent Event Centre’s new project, the Kent Invicta Chamber of Commerce were eager to book the Hall as the location for their annual Construction Expo in October this year. “This investment enhances the already excellent range of facilities. The hall has generated a lot of interest from prospective customers and I’m confident it will enable us to break into new markets in the years ahead”. Furthermore, a spokesperson from the Kent Event Centre described that the Exhibition Hall will provide a range of features for all who visit. Clients will benefit from easy access by road and rail, and can easily attend the Exhibition Hall whilst staying at one of Maidstone’s nearby hotels. Subsequently, the Kent Event Centre have successfully promoted the Exhibition Hall as the ideal venue through which to organise and host various events. As well as the new Exhibition Hall, the Kent Event Centre also offer visitors a plethora of different facilities. These include; the 1,700 square metre Clive Emson Conference Centre, the 1,750 square metre John Hendry Pavilion and the 151 square metre Astor Pavilion, as well as six major meeting rooms and free parking which is allocated for up to 10,000 vehicles. The search for a Dreamland operator begins! © Copyright 2014 Gullands Community. All Rights Reserved.